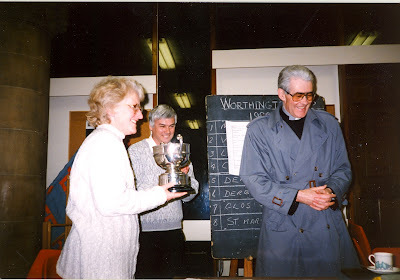 The winners of the 19th W. W. Worthington 10 bell Competition, held on 30th March 1996, were Derby D.A. (64 faults) for the second year in succession. Pat Halls received the trophy from Preb. 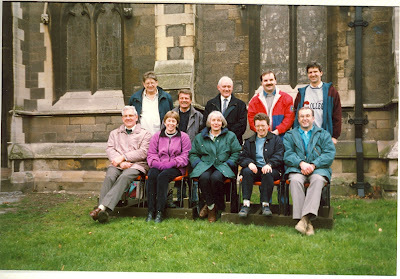 David Morris, vicar of St Paul’s, Burton-upon- Trent. 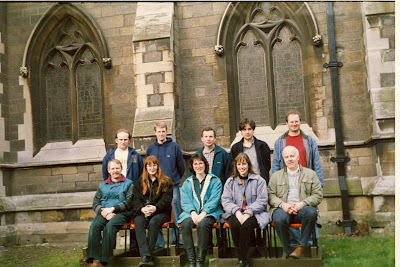 Derby have now won the competition four times in all, the same number as Worcestershire & Districts, but one short of the St. Martin’s Guild. The judge, Andrew Stubbs, placed St. Martin’s Guild 2nd (74 faults) and Coventry Guild and Gloucester & Bristol joint 3rd (77 faults). The remaining places were taken by Lichfield A.S. (5th), Worcestershire & Districts (6th), Midland Counties (7th) and a second team from Derby D.A. (8th). 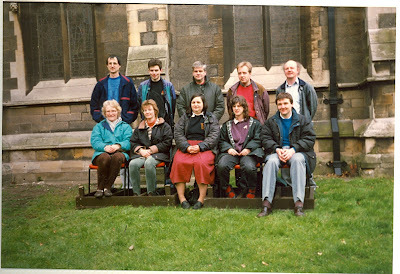 The date of next year’s competition will be 22nd March 1997. 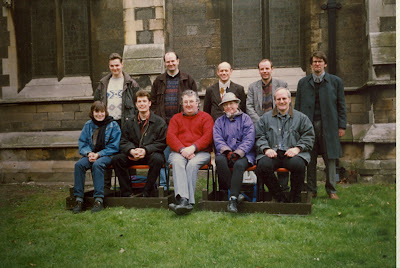 Simon P Griffiths, Frances Dodds, Donald T Finnemore, Timothy E H Waller, Anthea S Edwards, Anthony M Daw, Jonathan P Healy, Maurice F Edwards, Paul E Bibilo, Richard L Jones. 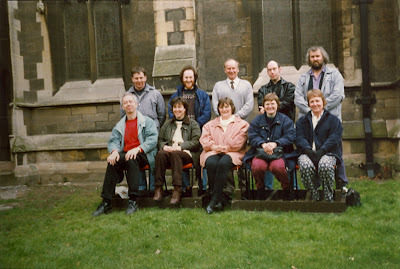 Mary Friskney, Elaine Scudamore, ?, ?, Charles Pipe-Wolferstan, Graham Sparey, David R Ware, Clive G Bryant, Ian P Hill, Keith W Scudamore. 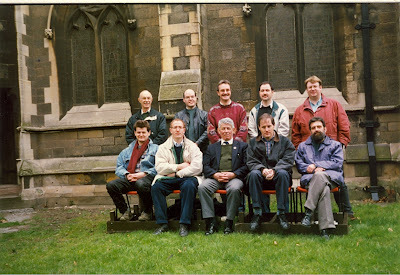 David G Franklin, Simon J T Wilmshurst, Alan E Hartley, Anthony J Barnfield, Andrew J Hartley, David Beacham, Robert E Havard, Paul M Evans, Charles S Hayward, C James Hustler. 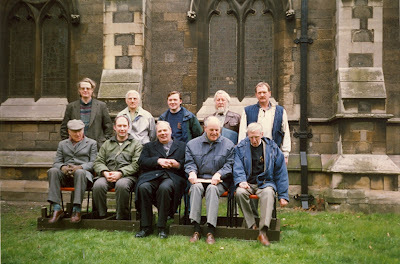 Clive W Longden, Frederick Ross, David H Sansum, F Gordon Faulks, Gordon A Halls, Simon Humphrey, John V Chadwick, Richard L Taylor, Philip Mehew, Tony Laughton. Pat Halls receiving the cup. 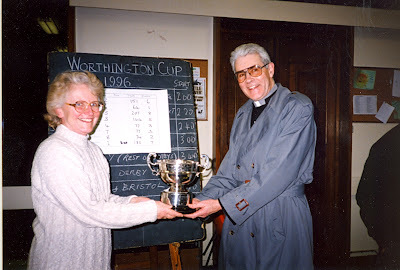 Pat Halls receiving the cup.